As an ecommerce merchant, you go to great lengths to monitor, analyze and improve every interaction that visitors have with your website and mobile apps. But your ecommerce search is languishing. Plenty of visitors may be conducting searches, but are they really finding what they’re looking for—and perhaps more importantly—are you seeing the kinds of revenue gains you expect from them? For many online stores, the answer is “no” — but before you throw even more people at the problem, take a step back and consider the findings from eConsultancy: site search users are nearly 2x more likely to convert, and yet 86% of users don’t use the site search. There are a multitude of reasons for this: a clunky interface, irrelevant results, or zero results returned despite relevant inventory. In short: outdated search engines do not help users or drive revenue. Can your site search measure up to Google? Superior ecommerce search is possible, but is rarely achieved with generic search technologies and default settings. Google, Bing and the search engines that all of us use every day have moved beyond keyword density-based relevance algorithms. Ecommerce search engines, for the most part, have not kept up. And while the specific functions of general search engines and ecommerce search engines are a bit different, user expectations from search results are higher than ever. From typo-tolerance to lightning-fast results to truly personalized recommendations, a comprehensive modern approach to search lets your site and mobile apps deliver superior user experiences while maximizing revenue. To look at site search as a convenience rather than game-changing capability, means that you’re likely losing a lot of sales. According to Constructor.io’s head of sales Kevin Laymoun, “search is a discipline in and of itself. Whether you’ve invested in search, merchandising, or both, the time has come to shift away from looking at both of these necessary systems as free-standing silos, and instead work toward integrating them into a seamless process that continuously learns from your buyers—a system that is worthy of continual investment and improvement. It’s not uncommon to have 40+ people concurrently working on improving search experiences. And while large teams dedicated to search provide a definite benefit, they can get caught up in low-leverage tasks. A common complaint from merchandising teams is that they spend two days out of every week entering redirects, synonyms, and permutations for every conceivable product misspelling. These manual entries deliver only modest benefits. What’s more, automation can excel at these tasks with less time and cost. 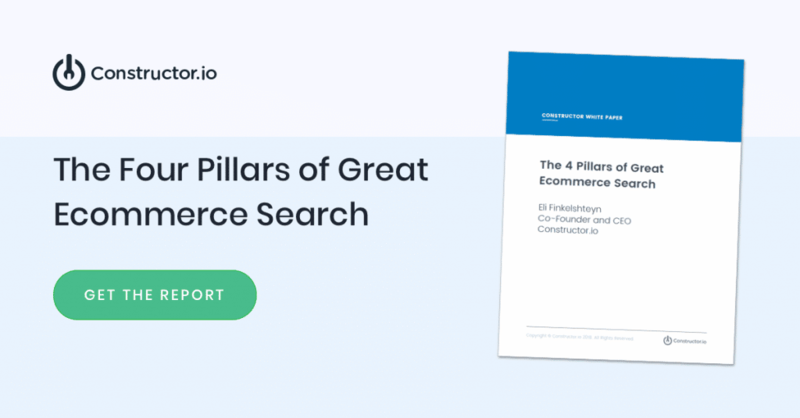 The main idea is to stop viewing site search as a generic component of your ecommerce platform and your search team as purely “search result tuners.” Instead, look at both as something more deserving of modernization—because they are. Getting search right is hard, so it’s easy to fall into the trap of believing that transforming search into a selling tool is beyond your team’s current skills and resources. But times have changed. Solutions like Constructor treat search as a data science problem that optimizes for your key business metrics. They make effective use of behavioral data, natural language processing, machine learning, and personalization to drive accurate, effective, and profit-generating search results without a huge outlay of time, money, and personnel. A superior search experience built on automated learning not only frees up time and saves money, but it also boosts productivity. As customers continue to use such a system, it continues to learn and improve results, creating high-converting search results that far exceed manually-tuned systems. Enabling merchandisers to supplement search results with seasonal product collections, promotional offers or clearance discounts is a smart marketing strategy that grows profits and customer retention alike. Search, merchandising and marketing personnel become more strategic and more productive once a modern search capability is in place. It enables your teams to collaborate and do what they do best, rather than agonize over tiny tactical improvements that barely move the revenue needle. This strategy, in turn has a ripple effect that allows the various teams to more closely work on seasonal promotions, inventory clearance, gross margin contribution and other things that contribute to growing the brand and growing profits. Why combine your search and merchandising experiences? Historically, separate functional groups for search and merchandising made sense. Today, with more effective search technology, closer integration and improved collaboration, ecommerce companies are able to bring together algorithms, data and strategy to improve everything from engagement to revenue. When you combine these very powerful conversion drivers, you can rack up a considerable number of “quick wins”. Once automated machine-learning processes are in place, the merchandising focus can turn to areas where algorithms benefit from human assistance. This allows you to not only highlight relevant products, but also spotlight those which will move inventory or highlight specific trends. Many retailers create “collections” through search merchandising that further inspire users to increase their average order volume when they buy. With a combination of search and merchandising, retailers get precise control over what’s shown, when and most importantly, to whom. What’s more, this kind of distinctive personalization does not require a lot of virtual hand-holding to implement and run. Improving site search shouldn’t be a “once-and-done” deal. 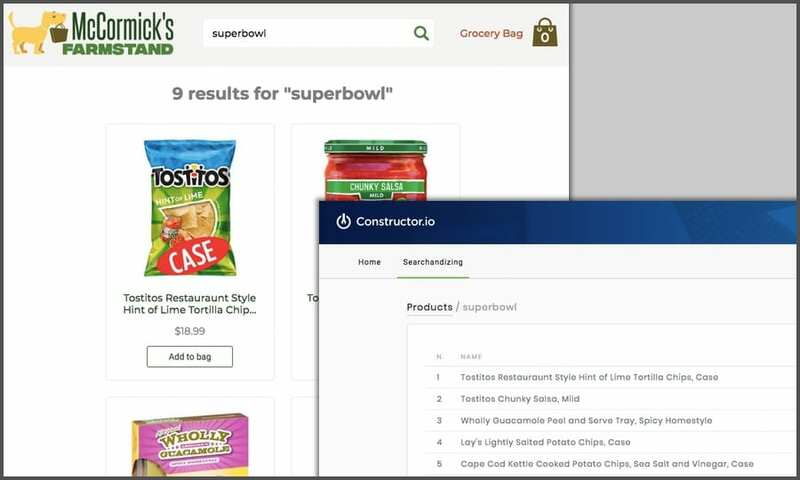 With Constructor, the platform’s machine-learning algorithms continue to learn, refine and improve product recommendations that are simultaneously deeply relevant to shoppers and supportive of business objectives. This creates a virtuous cycle of consistent growth without the need for constant labor-intensive tinkering of search results. The bottom line is that ecommerce search is evolving, and due to its growing importance in driving revenue, it’s worthy of increasing focus. Allowing search, marketing, merchandising, and branding to work together harmoniously creates a more memorable user experience—and that is the goal that every ecommerce brand should endeavor to reach.